Our beautifully restored 1948 & 1949 REO Speed Wagon trucks add character and ambiance to your party. Both trucks are completely self contained and include a wood fired brick oven, commercial refrigerators, three bay sinks, hand wash sinks, hot water heaters, quiet national park approved generators, retractable awnings, lights, work tables, serving tables, and on board sound systems. "Everything was fantastic! Wonderful staff and great pizza, of course! "It was such a pleasure to have you and your food truck crew spend the evening with us. Your pizza and, most importantly - your staff, was incredible. 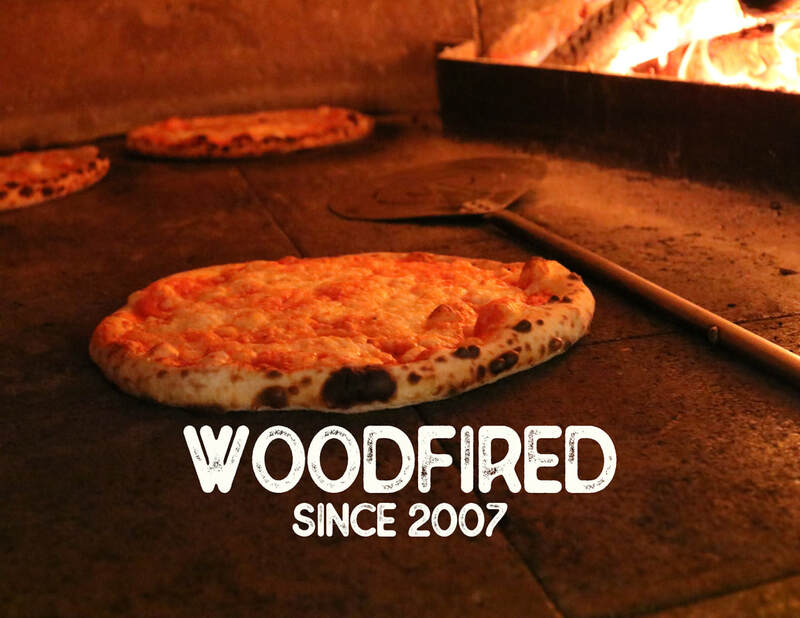 People were raving about the pizza and the friendliness of your staff all night." "I wanted to send a quick note to thank you for the most amazing party on Saturday. Your staff was unbelievable, and every guest at the party was raving about Nomad's incredible ambiance and food." LET OUR PIZZA TRUCK CATER YOUR NEXT EVENT! We serve for 2 hours after setting up. Lunch serving window is between 12pm till 3pm. Dinner serving window is between 6pm till 9pm. We can serve from 6pm to 8pm, or 7pm to 9pm. Late night serving window is between 10pm till Midnight. We can serve from 10pm to 11pm, or from 11pm to 12am. Some time adjustments can be made if possible. We arrive approximately one hour before serving time, to set up. Sometimes parties (especially weddings} run behind schedule. If possible we will stay an extra hour at $3pp. We need a level and safe place to park. We often park in driveways. We are not responsible for possible oil drips from our truck. Sometimes street parking is possible. Please make sure it is legal. Our trucks weighs over 11,000 lbs We often park on lawns. The ground must be level, dry and firm. It is your decision if we park on your lawn. Should the ground be soft and the truck causes ruts, we cannot be responsible. Please make sure there is nothing underground that the truck might damage. We cannot be responsible for damage to lawn, landscaping, septic system, sprinklers, or anything underground. Our trucks are beautifully restored antique REO Speed Wagons. They are 20 ft long and 8ft wide and 20 ft wide with our awning fully extended. We have our own water on board. We have sinks with hot and cold running water, lights and a small sound system. While we have a generator, we can plug into your outlet to keep things quieter. We serve buffet style. We make unlimited pizza for your group size. Usually there is a line at the beginning of the party but we make pizzas quickly. After the initial rush, guests are welcomed to make special requests, and we will do our best to accommodate. We will continue to make pizzas until everyone is full. We love making pizza and encourage guests to eat as much as they want. We understand there are many allergies and dietary preferences. We accommodate vegan, vegetarian and gluten free diets. Please let us know about any special requests beforehand. due to the open use of flour on our truck. Please provide a final guest count 7 days prior to your event. Sometimes more people show up than expected (especially when pizza is involved). No worries. We always bring more pizza than we need. We will bill you for the additional amount. We do not provide drinks, ice, cups or straws. These items are provided by the host. We can provide drinks at an additional cost of $3pp. We require a $250 deposit to hold a date. No party is considered 'booked' until the deposit is received and accepted. Deposits are strictly first come, first served. Please be prompt with your deposit. Your deposit, less a $100 booking fee will be returned if you cancel more than 60 days in advance of your event. We will retain your deposit if you cancel less than 60 days in advance. Payment in full is due when the truck arrives at your party. We prefer cash or check. Should you use a credit card there is a 3% fee. We do not require, or expect a gratuity. Many customers, however, want to show their appreciation for our staff and ask for guidelines. A tip of 5% to 10% is always appreciated for a job well done. The party will usually move indoors, under a tent or some protected area. We will set up a serving table wherever the party moves. We have two beautiful REO Speed Wagons. The trucks are old and don't like to travel far. We try to stay within 20 miles of our home base in Hopewell, NJ. We sometimes will travel a greater distance for a larger party. There will be an additional charge for travel outside of our normal range. Often guests want to take pizzas home. Let us know if you would like us to provide this service for your guests at an additional charge. additionally insure them. Should your venue require local permits such as health and fire, we will bill you for those costs.